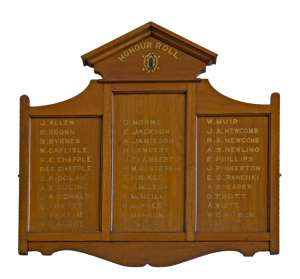 The Ultimo Presbyterian Church Roll of Honour, now located in the Ultimo Community Centre in Harris Street, lists the names of 36 men with associations to the Ultimo community who enlisted in the Australian Imperial Force (AIF). Four of those men never returned. 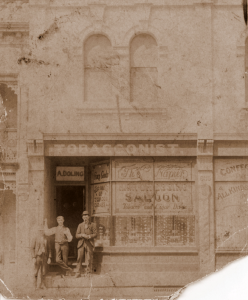 Their war service was recorded and their families marked their grief by advertising their loss in newspapers, writing to the authorities for acknowledgement and donating their mementoes to the Australian War Memorial. Here are their stories. Foster’s war service was tragically short. After departing Sydney he disembarked at Plymouth in October 1916. 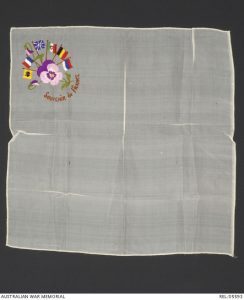 He was found absent without leave (AWL) in December before he was sent to the front in Étaples. The fierce fighting of the Second Battle of Bullecourt commenced at 3:45am on 3 May 1917 and it appears Foster was part of the first assault on German lines which was intended to break through the barbed wire.7’Second Battle of Bullecourt,’ Australian War Memorial https://www.awm.gov.au/military-event/E73/, viewed 20 September 2015; ‘Chapter XIII – The Second Battle of Bullecourt (II),’ Volume IV – The Australian Imperial Force in France, 1917 in Charles EW Bean, Official History of Australia in the War of 1914–1918, 11th edn (Sydney: Angus &​ Robertson, 1941), 545 The men of the 5th Brigade, which included Foster’s battalion, failed to get through the wire and were cut to pieces by machine gun fire.8Yves Le Maner, ‘The two battles of Bullecourt (April and May 1917),’ Remembrance Trails – Northern France, http://www.remembrancetrails-northernfrance.com/history/battles/the-two-battles-of-bullecourt-april-and-may-1917.html, viewed 20 September 2015 The Allied Forces advanced the line about one kilometre, at a heavy cost. 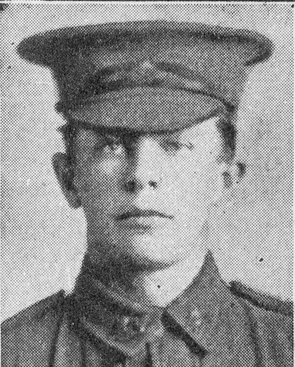 Foster was one of 7,000 Australian casualties. He was wounded in action on the first day of battle and then received gunshot wounds to his back and right arm. He died of his wounds on 5 May 1917. FOSTER.—Died of wounds in France, May 5, 1917, Private G. A. Foster. He marched away so fearless, his young head proudly held. Inserted by his loving uncle, E. White. In Cairo in February 1916, McIntosh was hospitalised with venereal disease. He then embarked for Marseilles and joined his unit in Étaples the following month. He was admitted to hospital in Boulogne on 11 June with a gunshot wound to his abdomen and suffering complications from a gas shell. He was classified as ‘dangerously ill’. Four days later he was taken off the dangerously ill list but was reported seriously ill again on 9 July and was transferred to England where he died, at Colchester, on 12 July 1916. His service record notes the cause of death was septic bronchitis and pneumothorax – illnesses caused by exposure to gas warfare. Newcomb fought in the battle at Poziéres from 25 July 1916. In August he received a ‘severe’ gunshot wound to his right forearm and spent the remainder of 1916 and early 1917 in convalescent camps in England, returning to his battalion in France in August 1917. He received a severe penetrating gunshot wound to his chest during the aftermath of the Battle of Menin Road in September 1917 and was again evacuated to England. Over the next few months, reports were sent of his recovery until a relapse forced authorities to send Newcomb home to Australia for further treatment. 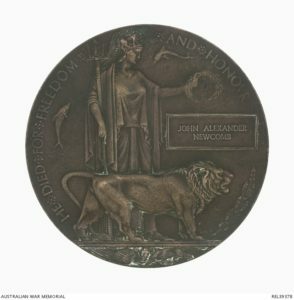 In the end, military authorities deemed his death was war-related and issued the family with a Next of Kin Plaque, known colloquially as a ‘Dead Man’s Penny’, which was given to the families of those who died on active service or whose deaths could be attributed to the war.